I have been searching for a tulle skirt for what feels like forever. I even purchased one online that I ended up hating. I just might have to look into this one! It is so lovely, and I like that it’s not overly-voluminous. Love love love this skirt! What a great find! That skirt is so pretty and affordable too. I picked up a black tulle skirt a while ago, and I keep putting it on, but I just don’t love it with anything. Definitely checking out this gorgeous number! I am loving these tulle skirts but I haven’t figured out how to make it work for me yet. Yours looks perfect! Bah! I love both so much! What a steal on that skirt. So very Carrie-like. Totally in love with that skirt! Your whole look is effortless! I love that you’re having a Carrie Bradshaw moment Jessica! 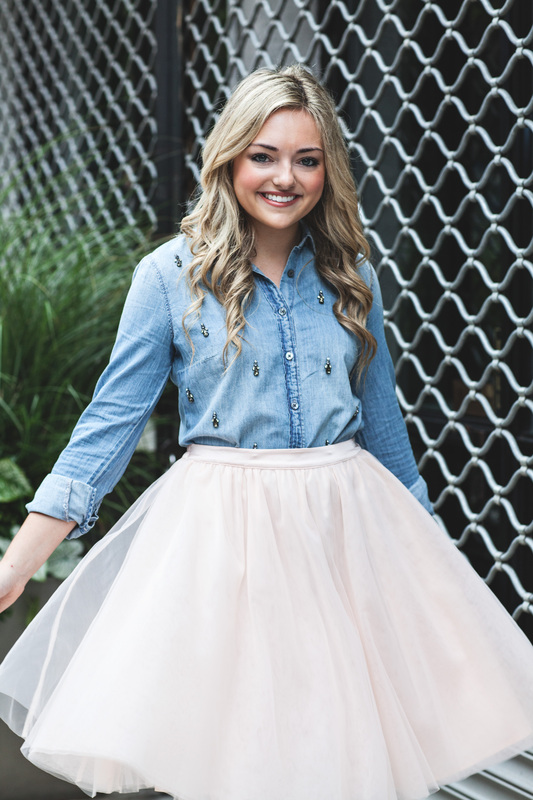 That beaded chambray is my favorite and the tulle skirt is so adorable. oh my word. I want this outfit. There, I said it. It’s far too light and fluffly for my all-black wardrobe, but it would be nice to mix it up a bit from time to time! My post today was partly about this too! I need to finds skirt like this!! I’ve been back and forth on the bejeweled chambray, but now I’m officially sold! The price of that skirt is unbeatable. I mean, you pretty much have to get it at that price! Love this skirt and how you paired it with chambray! Gorgeous! That skirt is so elegant, and so are the shoes, cobalt contrasts so fabulous against black! Lovely in this modern day ballerina look, the shirt is so pretty while the skirt is so feminine and darling! You look way too adorable dear! I’m really into the same crazy search for the perfect ballerina midi skirt, and I totally agree that it’s a hard finding! And you really put it so perfectly together! Wow I love it!! The store unfortunately only has largest not 🙁 lol I will have to find a skirt similar somehow! Do you think it would look nice with a dark chambray? I love tulle skirts too! I got myself an affordable one by buying materials and heading to my grandma’s house. I tried to learn how to sew, but mostly I stared in awe while she worked. So wish I knew how though! Love this outfit! 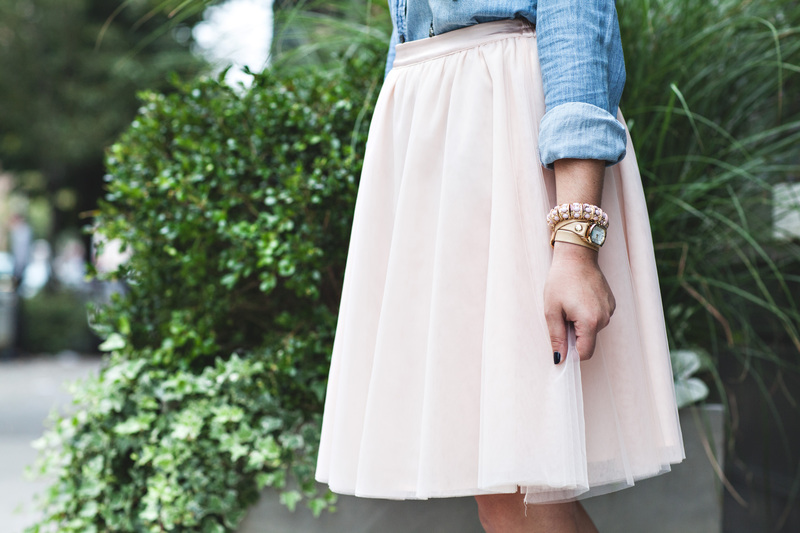 I have a very similar skirt I got form H&M a couple of years ago and I love pairing it with chambray! this skirt looks amazing on you, and I hope it will be the same for me cause I bought it immediately once I saw the amazing price!! Absolutely gorgeous on you, Jessica! What a find! Ever since the anthropoligie tulle skirt last holiday, I’ve been wanting a more affordable option. This is so cute, and the price point is perfect! What a find.